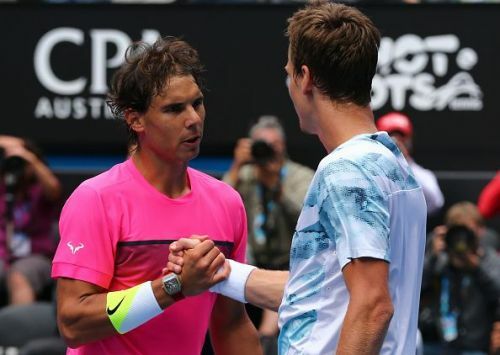 After three relatively easy wins against three Australians, world number two Rafael Nadal may face his sternest challenge yet in this year’s Australian open in the fourth round. Waiting for him will be the resurgent former top five player Tomas Berdych, who has looked very impressive on his return from a long injury-induced break. Like Berdych, Nadal too is making a return from injury. The Spaniard had not played a proper match before this tournament and there were concerns regarding his fitness. But he has allayed some of those concerns through his straight-set victories in the first three rounds. His remodeled serve has served him well, and with every match, he seems to be getting more and more comfortable with his new service motion. What worked for Djokovic last year when he had to remodel his serve to avoid possible injuries, could very well work for Nadal as well. In his first match against James Duckworth, Nadal was broken twice, but since then, he has held all of his service games, while breaking his opponent's serve multiple times. His victory against the next gen Aussie star Alex de Minaur was especially impressive, as he dictated the play for much of the match. In the process, he did commit six double faults, but still had an impressive 82% win percentage on his first serves. However, his next opponent may pose a greater challenge. Tomas Berdych, whose ranking has slipped outside the top 50, thanks to a long injury layoff, has not taken much time to get into groove on his return to competitive tennis. He was very impressive in Doha, where he reached the final. In this tournament too, he has looked almost as good as a top 10 player and unlike Nadal, he has had to face much tougher challenges in the early rounds due to his low ranking. He has had to play against world number 13 Kyle Edmund and world number 18 Diego Schwartzman, and he got the better of both the seeded players with relative ease. Though the diminutive Argentine managed to take a set off of him, Berdych looked the better player for much of that match. His first serve win percentage was quite impressive at 83 and he served a whopping 19 aces. It will be an exciting match between two players who seem to be on top of their game. It may not come as a shock if we have a major upset here. Australian Open has been Nadal’s least successful grand slam and this time it may come to an end even before the quarter-final stage, at the hands of a player who has had some of his best results in the year’s first grand slam.